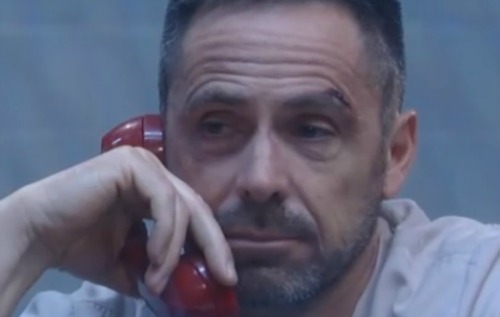 General Hospital (GH) spoilers for Wednesday, November 15, tease that Scott (Kin Shriner) will pay Julian (William deVry) a visit in prison. Julian will still look pretty banged up. He’ll have a large gash above his eye, so those thugs definitely aren’t backing off. Scott will realize Julian’s in danger, but he’ll think it would take a miracle to get him out of there. Of course, Alexis (Nancy Lee Grahn) doesn’t wait around for miracles to arrive. She gets busy and makes them happen herself. Alexis just confronted Valentin (James Patrick Stuart) about why he’s paying Liv’s (Tonja Walker) legal fees. When Alexis threatens to give Sonny (Maurice Benard) updates, Valentin will wonder what she wants. General Hospital spoilers say Valentin will try to get Alexis off his back. Giving in will be a whole lot easier than adding Sonny to his list of problems. With Valentin reluctantly on her side, Alexis’ mission to free Julian will move in the right direction. Meanwhile, Nina (Michelle Stafford) will drop a bomb on Cassandra (Jessica Tuck). She’ll put on a phony smile as their meeting kicks off, but it won’t be long until the claws come out. Nina will insist that she knows Cassandra lied to her. She’ll note that she doesn’t appreciate that, but perhaps she’ll salvage their “friendship” with her goal of manipulation in mind. Other General Hospital spoilers say Lulu (Emme Rylan) will have some exciting news. She’ll excitedly share a new development with Maxie (Kirsten Storms) in Wednesday’s episode. Lulu hasn’t been feeling very fulfilled lately. She loves her family, but she wants a new career to keep her busy. Fortunately, it appears Lulu has found something promising. She mentioned that she’d like to be an investigative reporter. Will that plan pan out? Lulu has a fun storyline headed her way, so stay tuned! Nelle (Chloe Lanier) will also seek employment on Wednesday. Since she’s desperate for cash, Nelle will jump at a new opportunity. Laura (Genie Francis) will find herself in need of an employee for GH’s daycare center. Nelle certainly wouldn’t be Laura’s first choice. She doesn’t have the best reputation around Port Charles, so Laura should have some reservations. Nevertheless, Nelle has worked as a teacher’s aid as well as Charlotte’s (Scarlett Fernanez) nanny. She’ll hope her experience can win Laura over. However, a victory for Nelle could spell big trouble for Nathan (Ryan Paevey) and Amy (Risa Dorken). Nelle overheard Nathan talking to Maxie about their secret, so she’s got more ammunition. For now, Amy will only be focused on Chet (Chris Van Etten). When she opens up to Nathan about her concerns, he’ll urge Amy to take her own advice. Nathan will call her attention to a particular piece of guidance and Amy will try to trust her instincts. It sounds like a great GH episode is coming up. We’ll keep you posted as other General Hospital details emerge. Stick with the ABC soap and don’t forget to check CDL often for the latest General Hospital spoilers, updates and news.